This design of this fanciful cabinet is inspired by the shape of the Greek letter "PI". 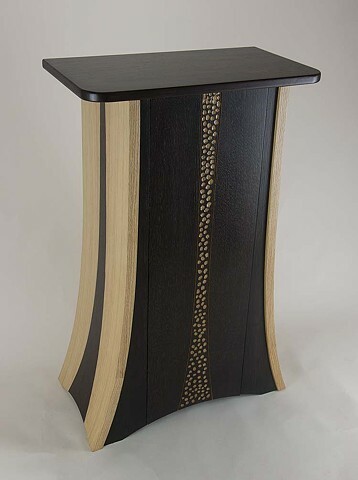 The top and accents on the sides are wenge; the remainder of the cabinet is made with quarter sawn white oak hardwood and veneer. Inside are 3 shelves for storage. The door is oak, stained to the color of wenge, with the decorative pattern carved through the stain to reveal the oak. H 40" W 25" D 14"